Welcome! A theme of my over 35 years of service on the City Council has been to help preserve and enhance our community and to help solve problems for constituents. I invite you to call me at home at 617-566-3848, e-mail me at CouncilorBaker@comcast.net, or write to me at Newton City Hall, 1000 Commonwealth Ave., Newton, MA 02459. In the meantime, I also invite you to learn more about the City Council and how I might be helpful to you, as I have other citizens for three decades as the Ward Councilor for Ward Seven. (Ward Seven is roughly the area of Newton east of Centre Street south of Church Street, east of Grant Avenue, and east of Glen Avenue). I also want to express my gratitude for the opportunity to continue to serve you and other citizens again as a Councilor next term. 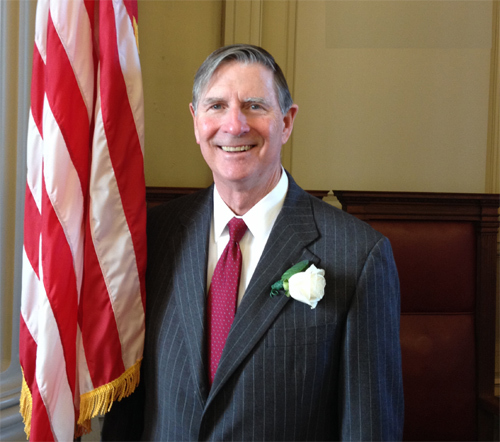 Lisle at his recent inauguration, where he was elected President Emeritus of the City Council by his colleagues.